The singing of Polish and Lithuanian anthems and the performance of ”Wilenka” Song and Dance Ensemble from Vilnius’ Władysław Syrokomla High School opened the ceremony of 25th anniversary of activity of the Association of Teachers of Polish Schools in Lithuania „Macierz Szkolna” (eng. Alma Mater). The ceremony took place on Friday 18 December in Polish Community Centre in Vilnius. The president of ”Macierz Szkolna”, LR Member of Parliament Józef Kwiatkowski has summed up the quarter century of Association’s work, and emphasized that the past 25 years have been a very dynamic period in the history of Poles in Lithuania, marked with both triumphs and difficulties. ”Even in the worst nightmares we could not predict what is happening right now: we have to fight on the streets and in courts for our right to study in the native language. Despite the constant obstacles, we managed to sustain a traditional Polish school, also maintain and strengthen the teaching personnel. Polish educational institution in Lithuania is stronger now, more resistant and in a better condition. It became mature and braver in the fight for its rights” — with these words the president of ”Macierz Szkolna” summed up the past quarter century in the department of education. J. Kwiatkowski mentioned many successes of Polish school in Lithuania, spoke about the problems faced by the Polish education, e.g., the removal of Polish language exam from the list of compulsory Matura exams, the amendment to the Education Act of 2011, which until this day poses a threat to a few of the Polish high schools in Vilnius. Despite all that, the president remains optimistic: ”The Polish School in Lithuania will defend itself, because the society is very determined and convinced that their actions are right and will benefit the next generations of Poles in Lithuania”. I really appreciate the consistent work of ’Macierz Szkolna’ that is expressed in many different ways” — the President wrote. He ensured that he is aware of the struggles faced by Polish education, and emphasized that he shares the worries of Polish community about the future of Polish education. He also expressed his hope that these issues will be solved. ”You can be sure that Polish authorities will always support you” — the Polish President wrote in the letter. At the request of the Polish embassy in Lithuania, deserving Polish educators in Lithuania were awarded National Education Commission Medals, which were given by the Polish ambassador in Lithuania – Jarosław Czubiński. ”May you teach the Polish children” — he requested, paraphrasing and giving a positive meaning to the Polish saying: ”May you teach other people’s children”. During his speech on behalf on the awarded, the Principal of the Rafał Malinowski Gymnasium in Nemėžis Zbigniew Maciejewki thanked for the award and expressed his hope that all Poles in Lithuania will be awarded: ”it motivates to step up and defend the Polish rights in the glory of Polishness, in the glory of our Vilnius, little homeland, in the glory of the Motherland. We hope that Poland will finally, after 25 years, award all the Poles living in Lithuania, what ensures the respect of their rights. These will be the most important honor for all of us”. Also the Polish Minister of National Education Anna Zalewska issued a letter to ”Macierz Szkolna”. The letter was read by the ambassador J. Czubiński. ”Polish authorities will constantly demand the right of Polish national minority in Lithuania to develop the education in Polish language” — the head of MNE ensured. Józef Kwiatkowski together with the head of Association ”Help for Poles in the East” Janusz Skolimowski, handed certificates of recognition for the members of the first ”Macierz Szkolna” committee. The memory of those who are no longer with us has been honored by a minute of silence. The head of ”Macierz Szkolna” addressed to the present guests, and emphasized that these people undertook such an important task with great enthusiasm 25 years ago, ”The struggle was not in vain” — he ensured. The Polish MP, deputy head of the Parliamentary Committee for Liaison with Poles Abroad Artur Górski read the letter from the Speaker of the Sejm Marek Kuchciński, and said that these 25 years were troublesome and full of hard work. ”You struggled not only with human and pedagogical issues, not only with the limited funds for the development of the education, school infrastructure and teaching materials. But you also had to find strength to face the bureaucracy, unfavorable officials and education law, which poses a threat to your educational existence. You have survived all this but at what cost? How much sacrifice and humiliation you have to stand?” — asked the MP and wished Poles strength and willpower. ”You can never forget that you are responsible for the young generation of Lithuanian citizens, for the local Polish youth, their education and what kind of citizens and humans they will become. What knowledge and skills they gain will determine their professional and economic future. What values they take as own will determine their integrity, decency and patriotism — national patriotism, Lithuanian patriotism, and a sense of belonging to the national community, Polish community for centuries rooted in this land. It depends on you whether the next generations brought up on this land will admit their Polishness, will speak and think in Polish language. Most importantly you fight for the Polish language; it has enormous value both in Poland and in Vilnius Region. Let’s protect it, because it is a key to the ”Polish soul”. You have this key in your hands, here, in Lithuania. I want to thank you from the bottom of my heart and I wish you another 25 years of effective educational work. We, Polish politicians will protect you. The government of Law and Justice (PiS) will support Polish education in Lithuania so you don’t feel alone. You can count on us because we will always be with You” – A. Górski declared. Polish Senate’s head of the Committee on Liaison with Poles Abroad Janina Sagatowska addressed to the audience. She emphasized that she stands before Polish educators in Lithuania full of emotions and humility: ”Because I stand in front of people, who heroically, completely devoted, without any limits make Poland live here, in Vilnius, in Lithuania. St. John Paul II used to say that Poland is everywhere where the Polish heart beats. Poland is big because there is many of us around the world. He certainly looks down from Lord’s Kingdom with admiration at how you maintain, preserve, and you won’t let anyone forget where we are from”. Senator spoke about elite Poles of Lithuania and exceptional Vilnius patriotism. ”Poles in Lithuania beautifully create prosperity of the nation, also Lithuanian, because they are led with amazing hands and hearts of the Polish teachers. They care not only for the language, but also for the quality of teaching. This quality effects in almost all of them getting into universities, and by that they form Lithuanian elite, making all of us living in Poland, or anywhere else, proud. You have to come here, to Vilnius to hear the Polish hearts”. Also the Marshal of the Senate Stanisław Karczewski in his letter wrote about the Poles in Lithuania being an example of patriotism. ”I ensure you that for many of the Poles in the country you are an example of patriotism and love for the Polish culture”. The head of the Electoral Action of Poles in Lithuania (AWPL), Member of the European Parliament (MEP) Waldemar Tomaszewski thanked the Polish education community for the hard work put into the Polish education and the whole community in Lithuania. The AWPL leader rated ”Macierz Szkolna” activity very high: ”You passed the exam with the highest score. You maintained what you inherited from our ancestors and you continue the good work”. MEP emphasized that the significant indicator of Association’s activity are the statistics. ”When you started, 2% of all students attended Polish schools, now it’s 3,3%. Despite the unfavorable conditions you had a 65-percent increase”. The head of Electoral Action indicated that the level of education in Polish schools is the highest among all the language groups residing in Lithuania, and also the Polish community should be proud of the higher than the country’s average index of graduates getting accepted into universities. While defining the aims and tasks for the future, the AWPL leader mentioned retaining the education from a nursery to university education and unburdening the teachers from the constant battle for Polish education so they can focus on teaching. W. Tomaszewski highlighted that the Committees of School Defence are emerging, and the Polish Parents Forums are operating with higher intensity. He said that the issues of Polish education should be solved on social and political grounds, he informed about the most recent dialogues with Lithuanian politicians about the matters of accreditation of Polish schools in Vilnius, and about the fact that some Lithuanian political communities are expressing their goodwill. ”We must send a clear message to our adversaries, that they can expect even firmer and more active moves” – W. Tomaszewski declared his determination and ended his speech with an optimistic announcement: ”Everything will be fine”. 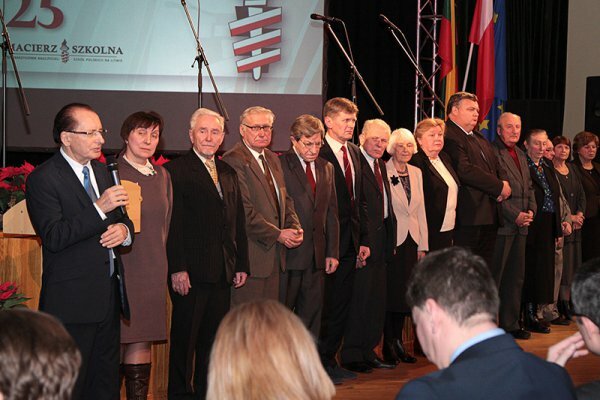 In the next part of the ceremony, the awards established by ”Macierz Szkolna” went to the most deserving strongmen and stwongwomen of the Polish education in Lithuania and all the presidents of the Association’s circles. The advisor of Lithuanian Minister of Education and Science Ritas Vaiginas, passed the congratulations on behalf of the head of the department Audronė Pitrėnienė and handed over the certificates of recognition for the teachers form Polish schools. The congratulations and acknowledgements on behalf of the AWPL in Parliament were expressed by the head of the parliamentary club Rita Tamašunienė, who emphasized that the voice of ”Macierz Szkolna” is ”clear and heard in both Lithuania and Poland. She also thanked for promoting the Polish education, supporting teachers, creating opportunities for the youth to develop their passions, and for being competitive at universities and on the job market”. The president of ZPL (Association of Poles in Lithuania) Michał Mankiewicz, Lithuanian Member of Parliament, thanked and congratulated the management – Józef Kwiatkowski and tireless Krystyna Dzierżyńska and the members of ”Macierz Szkolna”. ”We are all in the same boat: we work together for our love – Polishness. It lives inside us” — he said and expressed his hope for another ”Macierz Szkolna” jubilee. The head of the Department of National Minorities Vida Montvydaitė pointed out that national minority schools are a treasure, a Lithuanian heritage and a part of its history. She agreed with W .Tomaszewski that Polish schools’ results are amazing. ”Polish schools graduates have amazing education and are intelligent people” — she said and added that at least a third of the Department workers are the graduates from Polish schools. The president of ”Help for Poles in the East” Foundation Janusz Skolimowski together with the vice-president of the Foundation’s board Ewa Ziółkowska handed over the certificated and ”Help for Poles in the East” Foundation’s Medals of Honor „Meritus Patriae” for the president and vice-president of the ”Macierz Szkolna” – Józef Kwiatkowski, Krystyna Dzierżyńska and Michał Mackiewicz. Vice-president of organization’s National Board Dariusz Bonisławski during his speech on behalf of the ”Polish Union” Association, said that this time only flowers will be given to the management of ”Macierz Szkolna” because in the past 25 years of activity the organization has been awarded all possible orders. After all the speeches and wishes, the grand ceremony ended with Christmas meeting.